RADSpringfield's garage is filled with bikes, most of which were donated, and can be purchased or "earned" through helping others with bike repairs. When H. Alex Weck first moved to Springfield from Boston, he realized there was a problem. The avid bicyclist couldn’t find a bike shop anywhere in the city. Now, standing in front of the garage at the rectory of the former Holy Family Church among a group of kids and volunteers discussing and repairing their bikes, Weck said he’s proud he’s been able to bring a needed service with the RADSpringfield Community Bike Shop. The garage that acts as RADSpringfield’s workshop is now owned by Springfield College, which is in the midst of its plans to renovate the rectory to create a community center. The college, Weck said, generously allowed RADSpringfield to continue to operate in the garage. “There is no running water, no toilets, just a garage, but it’s home and we’re thankful,” Weck said. In addition to sales and repairs at the Eastern Avenue location, RADSpringfield is a mobile shop with Monday workshops downtown at Make-It Springfield. The shop also participates in other community events. While termed a bike shop, RADSpringfield is a completely nonprofit venture. The vast majority of the bikes and parts that fill the garage were donated. 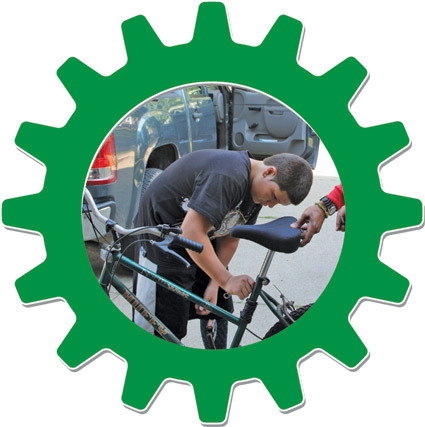 The money from any bikes purchased goes directly to buying more tools and equipment. Those who can’t afford to buy a bike can earn one by helping out others. The concept is not a unique one, Weck said. Similar operations have popped up in cities throughout the region. Accessibility to biking and the spread of knowledge are the major goals of RADSpringfield. Bikes are priced affordably and the option to work for a bike offers a dual benefit, Weck explained. “Our idea is nobody should ever go to the big box stores to buy a kid’s bike. They outgrow them so fast. Come to us and pick one up for $5 or $10 apiece and a kid can earn one just by learning and working with us for a couple of hours. 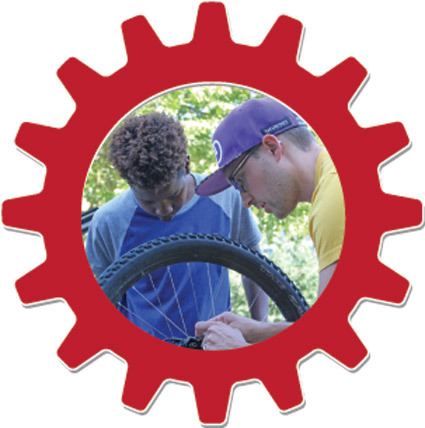 We’re as much about spreading the knowledge of bike repair as anything. It’s a skill that can develop into other skills and trades for kids of all ages, including adults,” he said. “For the youth, we really want them to learn and volunteer their hours to earn things and spread the knowledge. These guys have developed ways to do things without access to tools or a shop. I can’t blame them for doing things the way they want to, so we just try to enable them to do things and learn the way they want to,” he added. Talk of the bike shop is typically spread by word of mouth and through social media. Weck explained he has a small network of adult volunteers who help out when available and their involvement can open new avenues. “Jaime, for example, has been fixing bikes since he was little and he loves to help out and because he’s fluent in Spanish, we’ll be able to do things in more neighborhoods,” Weck said. A bike commuter in Boston for eight years and member of WalkBike Springfield, an advocacy group pushing for better safety and awareness for bicyclists and pedestrians, Weck said Springfield is slowly adapting to a more bicycle-friendly model. For his part, Weck is advocating safety to the youth who come to his workshops. “Someday I’m going to get you guys all wearing helmets,” he said to the group of youngsters, a statement that was met with groans. For more info on RADSpringfield, visit www.facebook.com/RadSpringfield or https://radspringfield.org or follow them on Twitter at @RADspringfield.